What is Sign Up Forms? Sign Up Forms provides easy to create, easy to track forms, registrations and payment collection for all types of events and activities. Our easy to use features save the organizer time and effort while getting them a custom personalized look and feel. Sign Up Forms provides an enjoyable experience for those registering whether they're using desktop, tablet or mobile. How do I make my registration look good on mobile, tablet and desktop? Signupfroms.com uses a responsive design. This means it adjusts to the size of your screen. It doesn’t matter whether you have a small cell phone, a large phablet phone, a tablet or desktop - it will look great! It’s easiest to see this flexibility on a desktop computer where you can adjust the width of your window. Give it a try! Will I get a bunch of spam and solicitation if I login to signupforms.com with Google or Facebook? No, you will not be put on any mailing list of receive any spam. If you use Facebook, we will not post on your wall, ever! This authentication login is a simple and secure way to login without requiring you to have another password. What if I don’t have a Google or Facebook account, can I still log in to signupforms.com? Yes, you can use your email address. If you already have a Facebook or Google account, these provide a safe secure way of signing in (and you won't get spam! 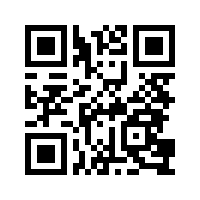 ), but if you prefer, you can log in with just your email address. It's easy! Just enter your name and your email address, then check your email. You will have an email from Sign Up Forms entitled "Please validate your email address" Open the email, click the link, and you're in! You can quickly create your first registration. Other login methods for info on other methods to login. 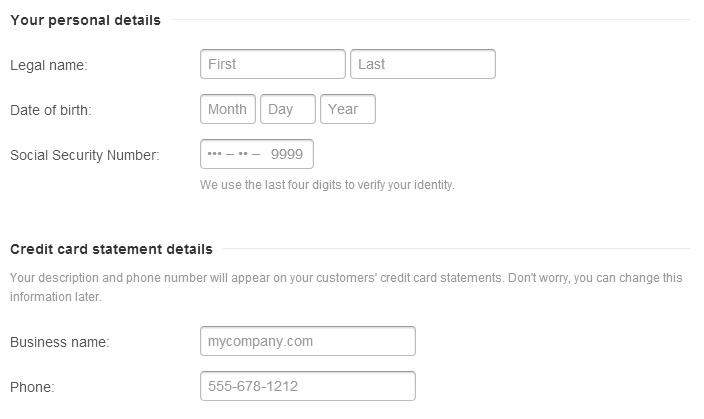 Look for a generic email registration option coming soon. How do I make simple changes like the colors, font and upload my own photo / logo? Select "Themes" at the top of the page and create a custom theme. Once it’s created, you can select it from within your event. 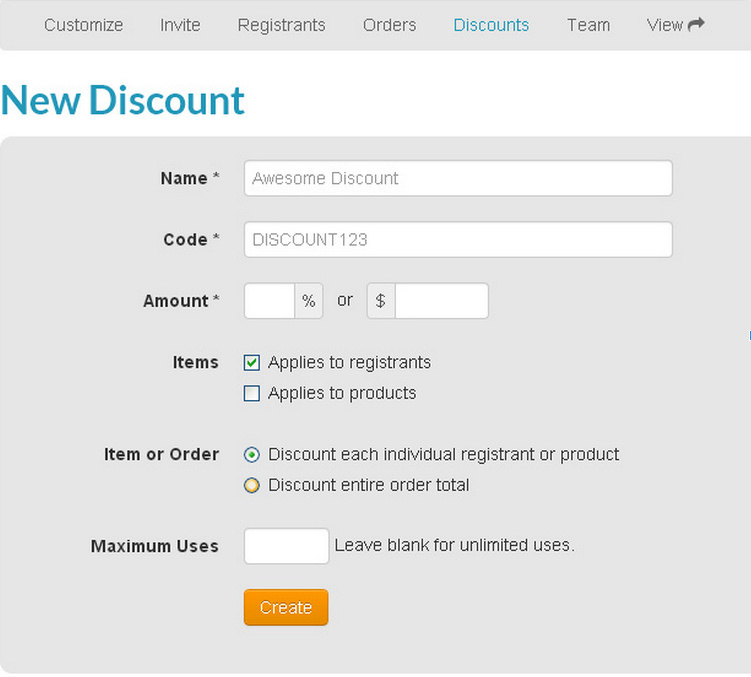 This allows an organization to create a theme to be used on multiple registrations. Also see Advanced styling for advanced graphics options. How can I move an image or text on a registration? or What if I want to do more than the standard customization of color, fonts, etc.? With an advanced custom theme about anything is possible. Under "Themes" select "Add a Custom Theme" and select "Advanced" below "name". If you don’t know CSS, contact us and we will work with you to set up a custom theme that you can use for one event or use for multiple events. Can I upload a file for the background? Yes, select "Custom Themes", select "Add a custom theme", under "BACKGROUND IMAGES - Body" select "Choose" to upload the background image of your choice. How can I reorder the items in my form? You can drag and drop most items to reorder them. Look for the common sign of the 4-way arrow showing that you can drag and drop to reorder the item. When do I use Multiple choice vs Checkbox vs Pulldown? Mostly it's personal preference, but some options can perform unique functions. If you want to be able to select more than one item then use "Checkbox". The "Checkbox" type of question allows one to choose zero items (if this question is not required), one item or multiple items (as many as the list contains). 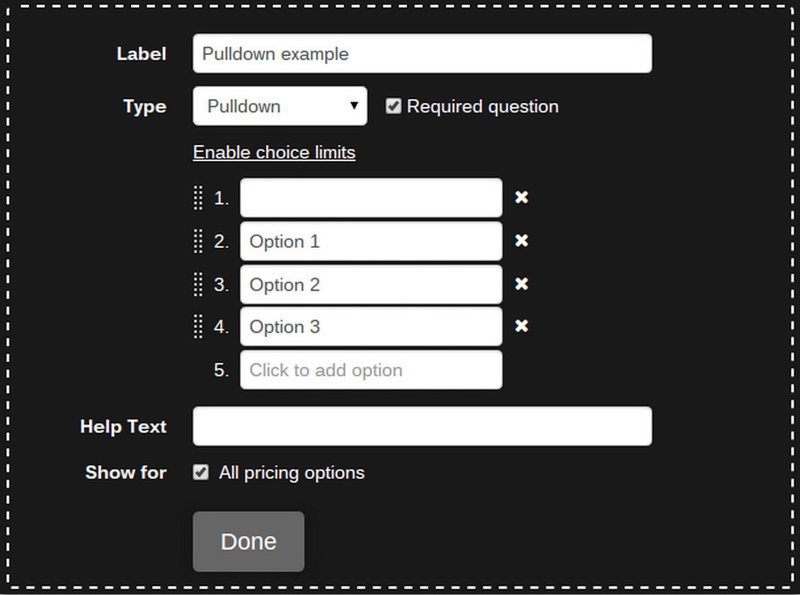 If a default answer is desired use a "Pulldown" type question. Make the selected default answer the first question in the list. Is there a way to include a pdf or something like that with info that people might need / want to print? Yes. 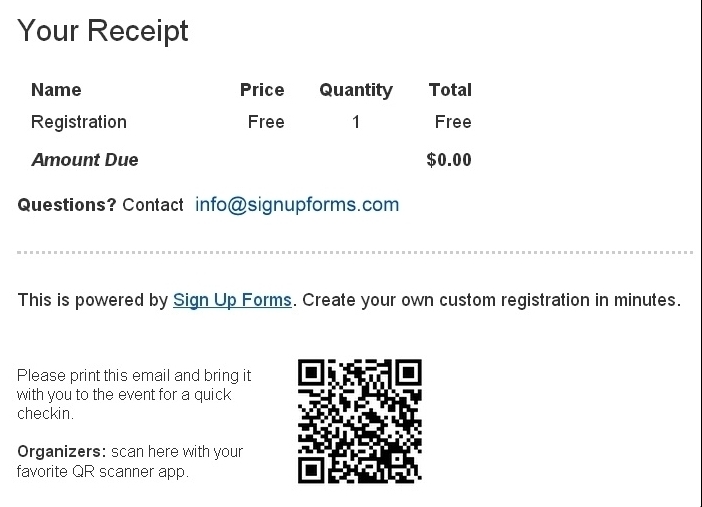 Upload the PDF to Google Drive or Dropbox and simply add a link to the document in the event details. Can a pricing option be made available (and visible) after a certain date? Yes, Edit the pricing option. Select "Show quantity and availability options", select “Availability Dates” to set the dates that you desire to have the pricing option available. Can you set the minimum or maximum number of people who can register at a time? 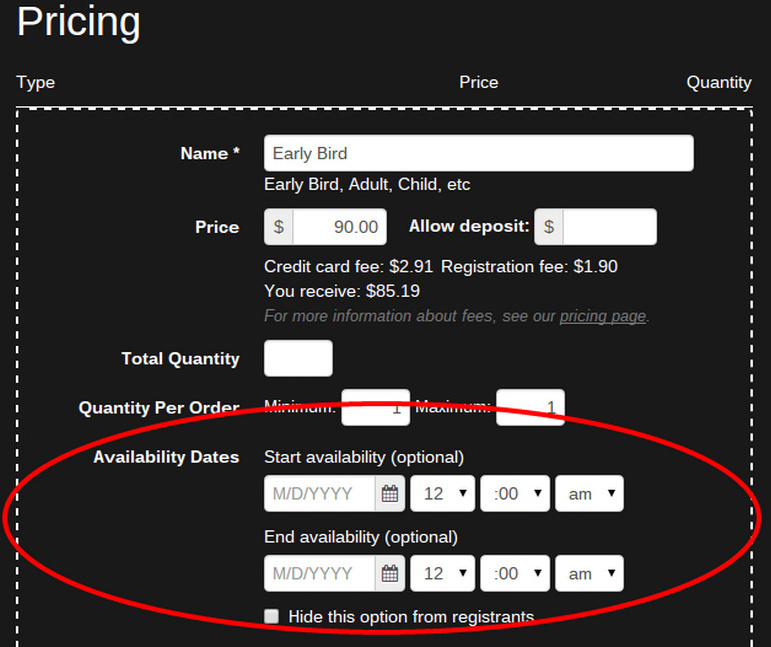 Yes, In the “Customize” tab, in the “Pricing” section, type in the Minimum or Maximum in the “Quantity per Order” line. 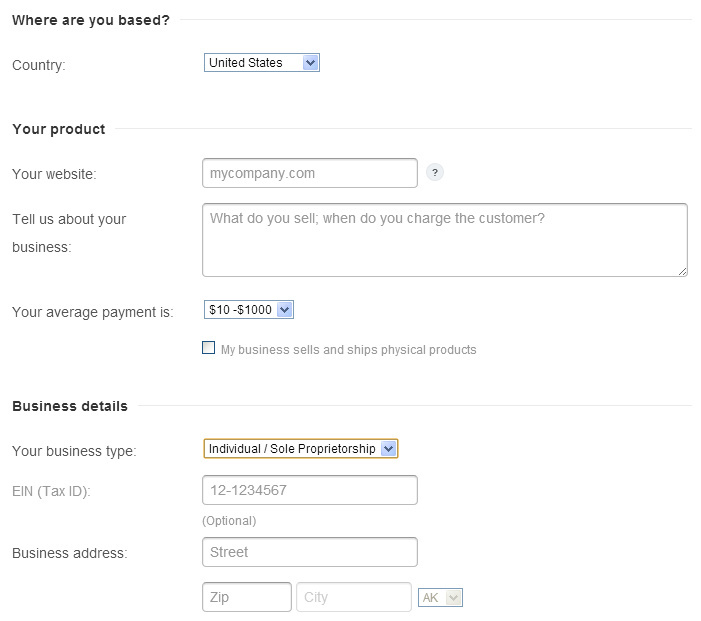 Example: if the minimum order is set to 2 then a person is required to register at least 2 people to get this pricing. Is there a way to display a question only if a previous question's answer is a specific value? No. But you can show/hide questions based on the ticket type. 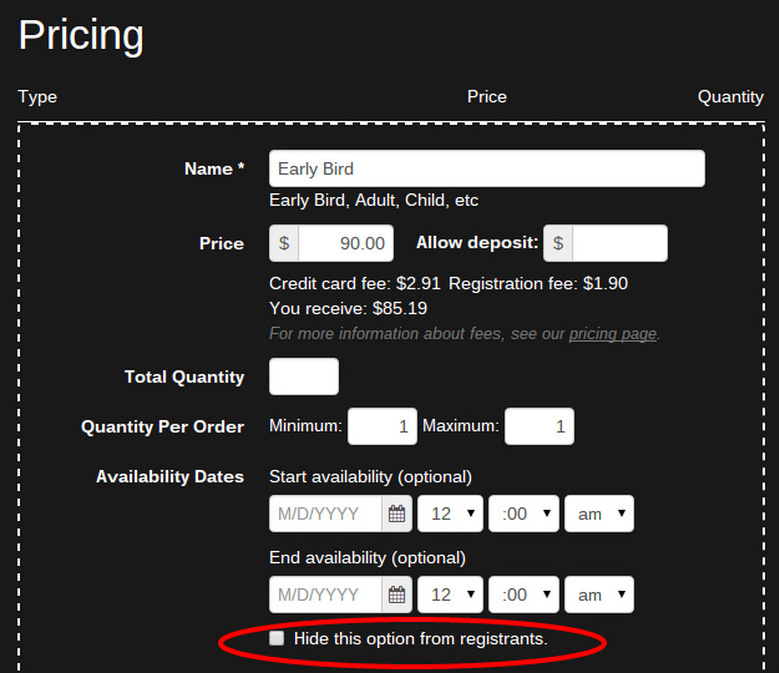 Example: In the “Registration” section of the form, the “Show for” tab is default set to “All pricing options”. If “All pricing options” is unselected, then a list of all of the pricing options is displayed. You can now select one or more of the following ticket types for this question to be displayed in. Can we remove the “price” column if the registration is free? 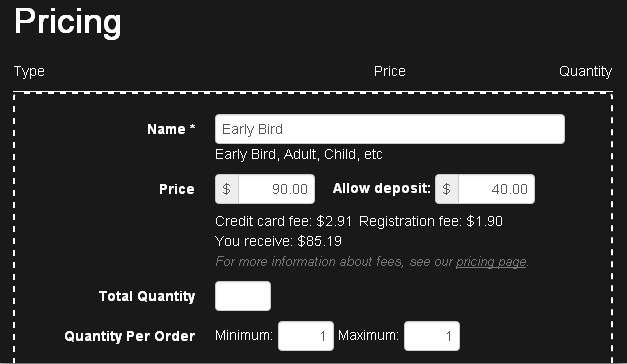 The registrants won't see "Pricing" - go to the "View" tab to see exactly what your registrants will see. Also, you can hide the column using a custom theme. Can you make a question that is specific to a ticket type? Yes, in the registration form, select “Show for” to select the registration type that you want this questions to be shown for. 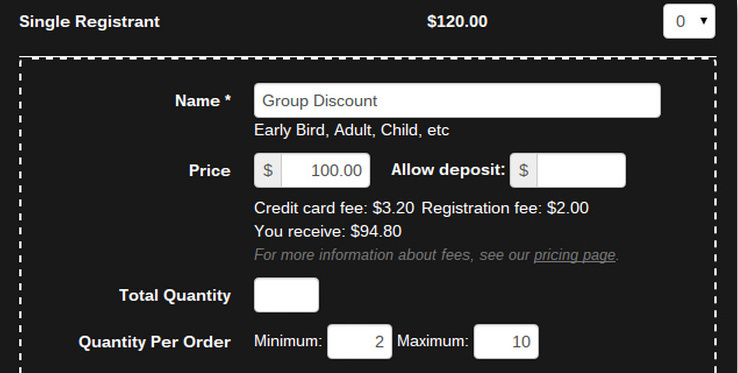 By default a question is shown for “All pricing options”. Unselect “All pricing options” to show the other pricing options. Select the pricing option(s) which you want the question to be shown for. What is displayed after the maximum number of tickets has been reached? The registration will read “No longer available” and the “Quantity” dropdown will be removed. Can I have other people help manage my event? Yes, select the “Team” tab, add the person’s email address, select “Add” and “Save”. 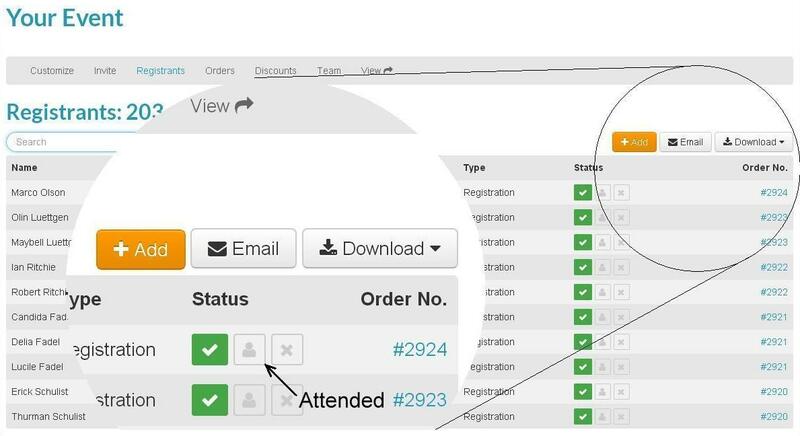 The added Team member can now help modify the registration and check in individuals. 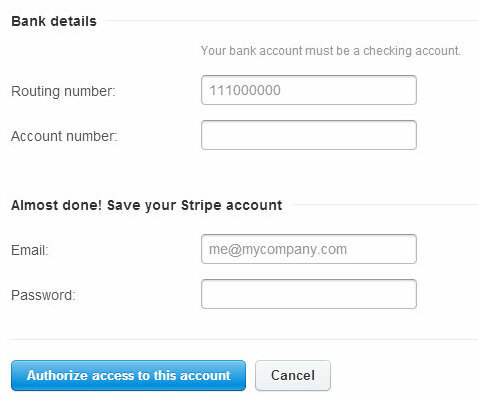 The only thing a team member cannot perform is change the Stripe account. Why does it say "Registration is currently unavailable"
If your registration states that your "Registration is currently unavailable", it is probably because there is not an active registration. From the "Customize" tab, scroll down to "Pricing" and select Edit. From here, ensure that the "Hide this option from registrants." check box is not selected. 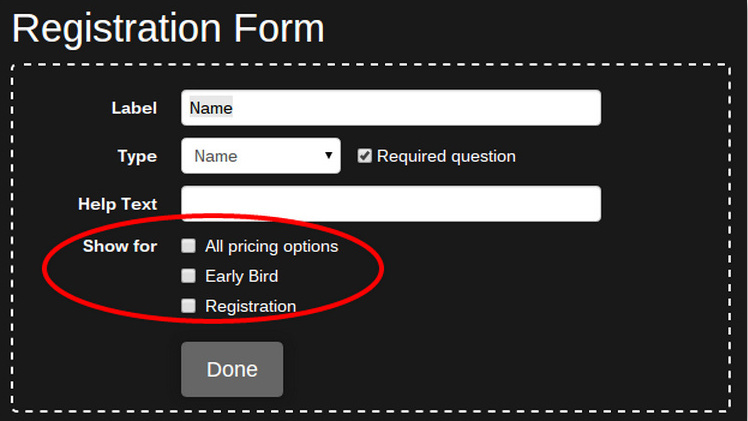 Another possibility is that there is no pricing option available at all: either Free or a Paid registration. If so, go to "Customize", under "Pricing" select either "Registration", "Donation", or "Product" to make your registration active. If a registration has gone past the end date of the event, the registration is disabled, and one can no longer register. The event organizer can, however, still enter a person from the back-end at any time. If the event end date has not passed, an event can be made inactive by editing each of the pricing tickets. 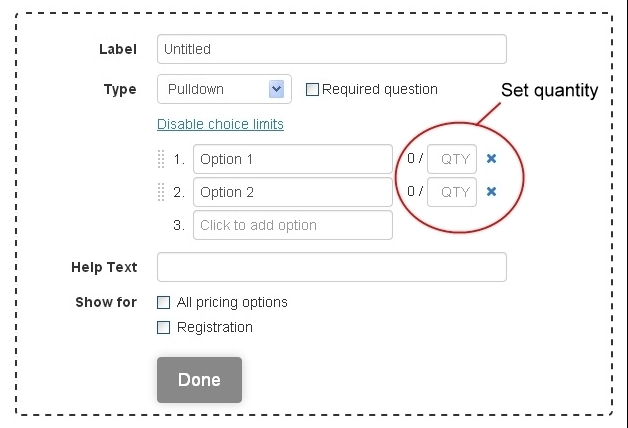 Disable each of the pricing options by selecting “Edit”, then selecting the check box for “Hide this option from registrants.” See image for an example. Can I limit the number of available answers for multiple choice questions? 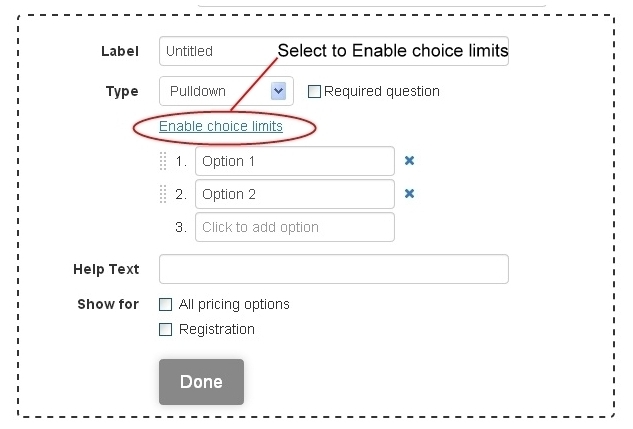 Yes, a quantity can be given a limit by selecting “Enable choice limits” on a “Multiplechoice”, “Checkboxes” or “Pulldown” type question. First click “Enable choice limits”, then enter the quantity that you want the item to be limited to. Once registrants have selected that answer that many times, the answer becomes disabled and unavailable. How can I make a pulldown question required but not have a default option? The first option of a pulldown will be the “default” will be the default value. But when the question is required and the first option is blank, the user will be prompted to select an option if none has been selected. What browsers does Signupforms.com work with? * Internet Explorer 6 and 7 are not supported by Sign Up Forms and may not show everything correctly or have all the functionality of modern browsers. Can Signupforms.com handle large (high volume) events? Yes. Hundreds? - Yes! Thousands? - Yes! Tens of Thousands? - Yes! We use Amazon S3 for our highly-scalable, reliable, and low-latency data storage and hosting. How can I delete my Sign Up Forms account? I signed up for Sign Up Forms but it's not what I was looking for, how can I delete my account. Rest assured that you won't get a bunch of spam from us. You can unsubscribe for the occasional updates if you'd like... but if you really want to delete all traces of your account then you can do that too. Go to your User Profile: when you are logged in, select your email address at the top right of the screen, in the drop down, select "Profile". At the bottom of the screen select "Delete User". Deleting your user will remove you completely from Sign Up Forms. Note: this option will be grayed out if you have a registration with Sign Up Forms in which case you will not be able to delete your account. Why does my image that I link to not display? If you are trying to display an image in your registration that you have linked to on the internet but it doesn't show up, this may be the issue. For best security Signup Forms is hosted over https (encrypted). Browsers will not show images that are hosted over plain http (unencrypted). Make sure to link to images that are hosted on https sites.